Meet the 2014 Founders: SentiSquare. Helping global brands become better listeners. The last of the 7 from 2014, SentiSquare began as an academic project by Josef Steinberger, assistant Professor at the University of West Bohemia. I caught up with Josef this week to talk about SentiSquare, a “sentiment analytics” engine that will revolutionize the way that global brands engage with their customers online and offline. Hi Joseph, where does the idea for SentiSquare come from? Several years ago, I started to research opinion summarization at the University of West Bohemia. There is an enormous and ever growing number of opinions about various entities all over the internet. For example, on Facebook alone, on Ford Motorcars company page, there has been over 37000 comments during the last year. And most of the comments are in English. If we include local Ford pages (ones for different countries), Twitter, LinkedIn, Youtube and various discussion forums, we end up with over 1 Million comments. I think that gathering that data and making sense of it through summarization has a great commercial potential. With the initial idea, I entered the Microsoft Innovation Centre (MIC) accelerator and the idea saw some further development. From there, I moved to the StartupYard program. Tomas and Michal, our top two NLP researchers at the university, joined me and together, with valuable advices of StartupYard mentors we further developed the idea and SentiSquare finally crystallized into a workable business idea. Is your whole team from academia? How did you all get together on this project? Yes, all three founders are from the University of West Bohemia. I’m an associate professor and Tomas and Michal are finishing their PhD theses. We started working on sentiment analysis together at the beginning of the year. We ran experiments for a Semeval’s shared task [an international NLP research community evaluation campaign] and we were ranked 3rd out of 30 participating teams. We joined forces for the brand-related opinion summarization project which I’d been already working on in the MIC program. Tomas brings the knowledge of semantic analysis and Michal’s expertise is in machine learning. What will SentiSquare allow clients to do? What will its limitations be? Sentisquare discovers the most important topics in social media content and automatically produces summaries of the topic-related comments. We can analyse millions of tweets, facebook posts, forum comments, and many other sources. It’s really the next generation of sentiment analysis. Basically, it does more than just produce sentiment polarity figures (e.g., how many times a brand was mentioned positively or negatively) but it answers the crowd sentiment question by tracking “key” opinions, e.i. opinions expressed by a large number of contributors. The trick is in identifying these opinions even when they are expressed in very different ways. These opinions drive brand reputation in a much more concrete way than “likes,” and so forthe. Sentisquare links topics across different brands, languages and periods, it will allow you to produce temporal, competitive and geographical comparisons. This will allow global companies and brands to get a good handle on their most common user complaints, the successes or drawbacks of their marketing campaigns, and their brand perceptions in a broad set of categories, for various demographics. The size of the data set limits the possibilities for the technology. If we don’t find enough relevant and content-rich comments about a brand (~1 thousand comments), the analysis won’t produce conclusive figures. To hone our models, we currently need over 1 Million domain-specific pieces of text, so this will apply to very big brands, probably with a global presence. So you need a lot of data. what kinds of companies and people do you see as your likely customers? Skoda [the leading Czech automaker, owned by Volkswagen Group], is a great example of a potential client. If they monitor what people are saying about the current car models, they can get inspiration on what people like, what they’d don’t like, what they want, and to which competing cars they compare Skoda’s models. This information can help in designing and marketing a new model. After the new one is out, the aggregation of the expressed sentiment about it can help in shaping the decisions taken. The power of sentiment analysis is in the fact that it goes beyond just sales figures and statistics. We can imagine this technology making the world a better place for everyone. For example, there are applications in entertainment as well. You know how Hollywood lives only on the box office take of whatever movie they release, no matter the quality of the film? Films all end up copying each other and looking pretty much the same. Plus, there’s a huge amount of risk in budgeting for a $150 Million film just because a similar one was successful. Well, what if our technology could help movie studios to understand what people like about their movies, and so allow them to *avoid* copying the things that don’t need copying. They could get ahead of trends, and really understand what the audience is yearning for before making the next film. Everybody wins. What do you see as your primary competition in this field? We feel that competition is a badly negotiated cooperation :laughs:. That means there is a lot of room in this market for new ideas, and new players. Even if current social media monitoring tools are nominally our competition, we’d rather position Sentisquare as a new layer on top of their functionality. We are investigating the possibility of cooperation with SocialBakers, BrandEmbassy, GoodData and eMerite, however, there are many others we would like to work with. Josef does some deep thinking. As an academic, what do you find most challenging about thinking in business terms, and talking to business people? The first difference is that in business we need to think much more about the target group of users and the business benefit our solution brings. Also In research, we push the quality of the technological solutions. For example, if we improve the quality of sentiment polarity prediction by 2 percent, we could write a famous paper about it. In business, it is more about uniqueness of the idea and differentiation from the competition. Business is about practical, workable solutions that deliver, not just theoretical models. How has your experience at StartupYard been so far? Which of the mentors has had the most powerful influence on your team and your direction as a company? We’ve learned a lot about the business world. Now we have a good basis for pitching, business planning, marketing, sales, and positioning the company and so on. There were many mentors who gave up a valuable feedback. Jan Šedivý and Jaroslav Gergic helped us to elaborate the API strategy. Marcel Vargaeštok introduced us to what the marketing research agencies do. Adam Zbiejczuk connected us with the local social media monitoring community. Viktor Fischer share with us his knowledge about sales possibilities and company directions. And finally, there were crucial times when every positive feedback was important for us, like the one from Roman Stupka, Philip Staehelin or Jan Muehlfeit. https://startupyard.com/wp-content/uploads/2014/06/logo.png 311 255 Lloyd Waldo https://startupyard.com/wp-content/uploads/2015/02/Logo.png Lloyd Waldo2014-06-09 09:00:092014-12-17 13:37:49Meet the 2014 Founders: SentiSquare. Helping global brands become better listeners. This Tuesday, StartupYard 2014’s founders experienced a grueling workshop from Prague’s own Lindsay Taylor, actress, producer, performance trainer, and Founder of Prague Film and Theater Center (PFTC). She came in to coach the founders on their Demo Day pitches, and to share tips on how to perform under pressure, how to breath and relax, and how to deliver a powerful address. I caught up with Lindsay after the workshop to ask her for a few public speaking pointers. Now that you’ve met with the founders of StartupYard 2014, what do you think is the most important thing for them to work on before the Demo Day? I think to remember that they really are the BEST people to speak on their company (and their own) behalf. And on Demo Day the audience will come to see exactly that. They are all such great, motivated young minds and entrepreneurs, that for me the most important thing they need to work on is believing this fact. Additionally the founders need to find a way to access this belief within themselves (via any number of relaxation, focus, awareness,clarity, improvisatory exercises) that gets their entire energy in a natural and comfortable place. It is in this state that we can access our natural breath and posture, but more importantly allow us to see and hear you and essentially see and hear your story. Because really, its not a pitch presentation. It’s their story. And you have to be brave, vulnerable, and present to tell your story. Yet, this type of communication always makes an impact. What tips would you give an inexperienced speaker to handle jitters before a big presentation? Josef of Senti2 gears up for his monologue exercise. Focus on the breath. Breathe through the nose and expand the diaphragm as you inhale. Exhale with a controlled and slow breath exhausting the diaphragm. Try to regulate your breathing while you wait. Try to think about feeling the energy of the room and the people in it, and less about what you need to say. Don’t get me wrong, nervous and excited are good feelings as well. You can use it to your advantage as its already giving you an electrifying energy that can drive you forward – just don’t let it get the best of you. Breathe and find a way to channel nerves to focused relaxation. Repeat controlled breathing. Your voice and the audience will thank you for it. You will have more resonance, volume, and tone and color just by simply focusing on your breathe. This also physically makes your brain happy with oxygen. Improving clarity of thought, and ability to improvise. You focused a lot on warmups and mental focus during our workshop. What are your favorite mental and physical warmups, and why? My all time favorite is the roll over “hang”. After stretching and elongating your entire body, bend like you are going to touch your toes, but instead just let go and hang. Neck loose, head facing the floor, knees bent, feet shoulder with apart, arms hanging down to the floor. The actor/presenter stays in this position, letting go of tension, allowing breath to release their body further towards the ground, allowing gravity to take effect. When you are ready, roll yourself up. I’ve seen actors and performers stay in this position for 30 minutes before rolling up to actor neutral. When you do decide to roll up, think about stacking your vertebrae one on top of the other- balancing your entire body each time you do so . Your neck and head are the very last thing to come up. The saying should be “balance up straight” and not “stand up straight” – When we force our backs into having “good posture” we are automatically inserting tension and painful energy into our physicality. But if we’ve found center based on a reset of your body (which is essentially what the hang is) this allows us to be in the most natural, easy, and upright position for body. This is the single best thing I know to do to be present physically, mentally, and emotionally. You should do this once a day, public peaking or no public speaking. All of our founders speak English as a second language. What are some really effective techniques for training oneself to speak clearly and understandably? Each founder had to deliver a dramatic monologue. Native English speakers need to stretch their mouths, warm-up their vocal range, and exercise the various sounds before speaking in public. So as a non-native speaker this is even more true as you are most likely already struggling to place the sounds correctly in your mouth anyway. • Big Face/Tiny Face: Make your as wide and open as possible (mouth, eyes, eyebrows, cheeks. Then quickly make your face as tiny and tight as possible. Repeat If you fully commit to the stretch, your face will feel ready for anything after. • Tongue Twisters- There are plenty. The internet is full of them. They work. And you will get better at them. Diction and articulation are essential to hearing you and understanding you. Don’t skip this step. Originally trained in theatre, Lindsay earned a degree in Theater Arts from McDaniel College. Lindsay splits her time between work with Prague based film studios and theater companies. Co-founder of the Prague Film and Theater Center, a network to connect creative professionals, create projects, and grow a database, she also works in film as a producer, casting director, acting/dialect coach, and AD. https://startupyard.com/wp-content/uploads/2014/05/IMG_0592.jpg 2448 3264 Lloyd Waldo https://startupyard.com/wp-content/uploads/2015/02/Logo.png Lloyd Waldo2014-05-22 11:40:492014-11-27 16:21:16Lindsay Taylor: "It's Not a Pitch. It's Their Story." Following a month of intense mentoring, all 7 of StartupYard’s Spring 2014 teams are ready to meet the world. While each of them come from a unique place, and a unique period of development, some with a massive code-base and near-complete products, and others without even a name, all of the teams have made impressive progress in the past month. Below is a review of the teams, with links to their websites, and a short ‘position statement’ description of each. Then we’ll go deeper, and talk about why we chose these teams, and how each has met the challenge that we made when we invited them to join us in Prague last month. The teams are presented in alphabetical order. Evolso is a next-generation dating app that gives the power back to girls through features not accessible to male users. Using the knowledge of their favorite venues, it lets users select people nearby based on common interests. Evolso presents a new way to break the ice and meet people in your favorite common places. Evolso impressed us from the get-go. We know what you’re thinking too. Really, another dating app?” We’ll remind you that some of the greatest product innovations of the last 2 decades have been in this market. Facebook wasn’t always for wishing Grandma a happy birthday. It started with dating as a powerful motivator. This idea does something that Tinder and traditional dating sites don’t: it gives people a great reason to get together, and it lets women meet the kind of men they want to be meeting. It also lets men be themselves. What could be better? The Evolso team is young, and they have a lot of room to grow into this market. We’re betting on them. Famely is a mobile magazine for fans who want access to all the latest news about and by their favorite people, in one place, at the swipe of a finger. We aggregate content from social networks and the internet to create a magazine filled only with information about and by people you like. There’s been a lot of joking with the Famely guys around the office. We called this one the “Justin Bieber App” for the first few weeks. But Famely impressed us with their design skills, and their vision for something that really doesn’t exist in the market: an app that aggregates content about people you geek out about. It’s simple, and that’s the best part. Famely is a member of a growing tribe of aggregation services, but they’re early in the game when it comes to this level of segmentation in the market. The app, by the way, is beautiful, and the possibilities are easy to grasp. Why should celebrities be the fodder of gossip rags? Let’s make fame a little more social. Gjirafa is the first search engine and news aggregator for Albanian, a lexically unique language spoken by over 12 million people worldwide. Using advanced Natural Language Processing algorithms, Gjirafa provides access to data that currently cannot be searched online. Where to start with these guys? The team is distinguished and full of fantastically talented people, with academic and business experience few of the teams can boast. When they came to us, we didn’t even know this market existed. But it does: Google doesn’t fully index pages in the Albanian language. No search engine does. But with the Albanian web growing exponentially, and Kosovo becoming a tech beacon in the region, it’s an incredible discovery for SY and for investors in Europe. It’s also great news for Albanian speakers, who are going to be heirs to the next Seznam. What’s not to like? MyPrepApp is a mobile and online service to help students who lack motivation to pass their important exams. MyPrepApp creates customized preparation plans for students, and uses gamification and friend support to motivate them to fulfill their study plans and achieve better exam results. In the Czech Republic, MyPrepApp.com was launched as Hrave.cz on April 29th, 2014 generating its first revenue on that day. It’s no secret that now, more than ever, the exam is king in education, in Europe and in the United States and elsewhere. Unlike most e-learning product/services, MyPrepApp, based on the already running Hrave.cz, focuses on results. The approach sets them apart from a lot of players in this market, and it allows them to engage with independent content providers, instead of bigger publishers, giving them a competitive and creative edge. SentiSquare is an online service for digital marketing managers who deal with high traffic and noise in social media and can’t comprehensively monitor what their consumers are saying about their brands around the globe. SentiSquare uses deep semantics to discover and summarize opinions hidden in multilingual content, giving a clear understanding of the main issues customers are facing. Not all great products come from entrepreneurial beginnings. SentiSquare started as a graduate project at the University of Plzen, and the team is very academically oriented. But what they don’t have in marketing and business experience, they more than compensate for with technical prowess. Their innovations are going to be of incredible value to clients with truly global customer engagement. If you’ve ever said a bad word about one of their customers, or a good one, they’ll know about it. Warrantly is a Software-as-a-Service for consumers who want to store their warranties in one place so they will never be lost. Users can track purchased items through their warranty period, report problems and more. Retailers and manufacturers can use this data to improve their products and gain new customers. You know that feeling, when you’re at the check-out line at Euronics, or Best Buy, or Tesco, and you know that there’s some extended warrantee they’re going to offer. But also you know something about how these kinds of products are supposed to be covered for a year by law. Or was it two? Or only 90 days? You throw the receipt in a drawer, and when the thing breaks 364 days later (which is guaranteed), you won’t know which receipt is which, and you won’t have the heart to fight back. No more. Warrant.ly is the best kind of idea: a simple one, with a huge benefit. It will keep you up to date with your warrantees, and save you money. It will also keep manufacturers and retailers accountable to their customers, and give them the opportunity to upsell and cross-sell customers who have and use their products. YourPlace is a mobile and web app for places who want to foster strong loyal relationships with their customers. We use advanced statistics and targeting, a creative offer system, to create unlimited opportunities for venues to organize bonus and loyalty programs. Mobile users receive constantly improving targeted offers from their favorite places. Who doesn’t like to feel special and be recognized? Dial-a-deal apps may seem to a crowded market, but YourPlace has an approach we haven’t seen before. The key is in prompting restaurants and venues to engage with their customers by offering them deals, which the app helps them to generate. An owner may not know much about what kinds of deals their customers are attracted to, but YourPlace gives them a way of easily finding out, and capitalizing on the experience of other nearby locations, and of potential users. There’s no risk to trying YourPlace, but there’s plenty of potential benefit, for owners and customers alike. Because of my work and my involvement in the startup community, I’ve seen a lot of pitches. I’m always happy when I see a pitch that achieves what it should – making potential investors and clients interested enough to learn more about the project. But, unfortunately, most of the pitches I see don’t even get close to that goal. There are even some that I would call disasters. Although I think there is a lot to learn from looking at the successes, there is plenty of information about how to pitch successfully. I’d like to tell you about some of the disasters I’ve seen and give you some ways you can avoid the same fate. My point is not to embarrass anyone (of course, the teams, accelerators and events are deliberately anonymous), but to show you what can go wrong if you’re not properly prepared. Picture this. Demo Day. It’s the end of the accelerator program and it’s time to show the audience and jury the projects that have made it through. The venue is full of potential investors, clients and members of the startup community. During the accelerator program, a lot of time was spent with mentors of every kind. Before Demo Day, the pitch was refined by a pitch coach and members of the accelerator team. The founder has just finished delivering the pitch and it’s time for the jury Q&A. I’m stunned. Is it a joke? No. The founder really doesn’t know what he’s going to charge for the product. He acts as if the question never occurred to him. All of that time, mentoring and coaching and no one brought up the topic of price? No one thought it was something important to discuss? Unfortunately, this incident isn’t the only time I’ve seen a founder embarrassed to realize that they don’t have some basic information about their project. Lesson: In my opinion, one of the advantages of going through an accelerator program is access to experienced mentors. The result should be that the founder has talked about many different aspects of their business with experienced professionals. It’s a shame that this doesn’t always happen. But, the founder needs to be proactive enough to realize that just because it’s not brought up in the mentor sessions doesn’t mean that they don’t need to think about it and come up with a decision. There is some basic information that you need to include in your pitch – the problem being solved, your target market, a clear explanation of your solution, your competitive advantage, the team and how you’re going to make money (just to name a few). Make sure you’re getting help making these decisions. If you’re not in an accelerator, you’ll need to do your own research and seek out people who can help you. After you’ve created your pitch, sit down with your team and brainstorm every possible question potential investors/clients could ask you – from the obvious to the off-the-wall. Make sure you can clearly answer these questions. You might even find that some of the topics should actually be a part of the pitch so go back and include them. The time spent in these question drills will pay off in the confidence you’ll have when it’s time to pitch. For some reason – maybe it’s the relaxed atmosphere or the perceived ‘laid back’ attitude of being in a startup – some founders choose to start their pitches with something ‘funny’. Examples that I’ve seen include dumping a bunch of paper out of a big box, wearing a ‘funny’ hat, telling ‘funny’ stories or asking the audience a ‘raise your hands if…’ question. When I look at the jury’s faces, they usually just seem embarrassed for the speaker. This is not the impression you want to leave with potential investors. Lesson: People often don’t understand the difference between a conference talk and a startup pitch. When you are delivering a pitch, the only people you’re addressing are potential investors/clients. These are serious people with serious questions. They want to be sure that you are someone credible enough to invest in. The underlying message in your pitch should be – this is an amazing investment that is going to make money for you. Let me tell you more about it. This is impossible to achieve if you lose the respect of your audience at the beginning of your pitch just because you were trying to be entertaining. This happened at a recent pitch contest for mobile applications and the stakes were pretty high. One founder got up and his whole presence said, ‘I don’t really care about this’. He started by saying, ‘Yeah, so my name is … and… uh… you know, we made this uh… app and you know…’ This stunning introduction was followed by a description of the app with lots of ‘yeah, whatevers’ thrown in throughout the pitch. I was on the jury and I’m afraid I wasn’t very kind in my feedback. This is not the time to act cool or like you really don’t care if you win or not. In this case, it was a real shame because the application was actually great, but the delivery of the pitch killed any chance of success in the competition. Lesson: There is NO way that someone is going to invest if the founder isn’t excited about his own project. If you can’t express your enthusiasm, have someone else on your team who has this ability deliver the pitch instead. In this case, the founder and I talked afterwards and his persona of ‘I don’t care’ was really just covering up his extreme nervousness. Don’t let this happen to you. We all deal with nerves differently, but the best way to take control of nervous energy is to practice until you know the pitch like you know your own name. I don’t mean you should memorize it – except for your first few sentences, don’t memorize. But, you should know your story and know where it’s leading and how it fits with each slide. It’s good to be nervous – it means you care – but the only way you can control your impression is to practice a lot. It was a crazy Monday. June 3rd. A part of Prague was flooded, we had to decide for go or no go for Demo Day on Tuesday. We did it and 200 attendees prepared a great evening to our 6 teams and judges. Thank you. The crowd voted for the best pitch and the People’s Choice went to AirCharts.co. 2 team members will be attending Pioneers Festival in Vienna. The judges – Peter Fabian, Amit Paunikar, Michael Schuster and Michal Truban – had a tough time to choose the best team … Hlidacky.cz, because: “”Hlidacky.cz provides a clear solution with the most potential of success given incremental direction and guidance and investment. The business model has been proven in other markets. They did really good job of explaining the problem and its nuances (parents/friends not always available, trustworthy service – an absolute must). And for obvious desire to succeed which became apparent during Q&A (“we tried this, did not work, so we tried something else” – profiles => video profiles => friends) – they’re working on the product layer by layer.” 2 team members will be exhibiting at Startup Alley and attending TechCrunch Disrupt in Berlin. All stuff from Demo Day (video, presentations, photos) is available at www.demoday.cz. 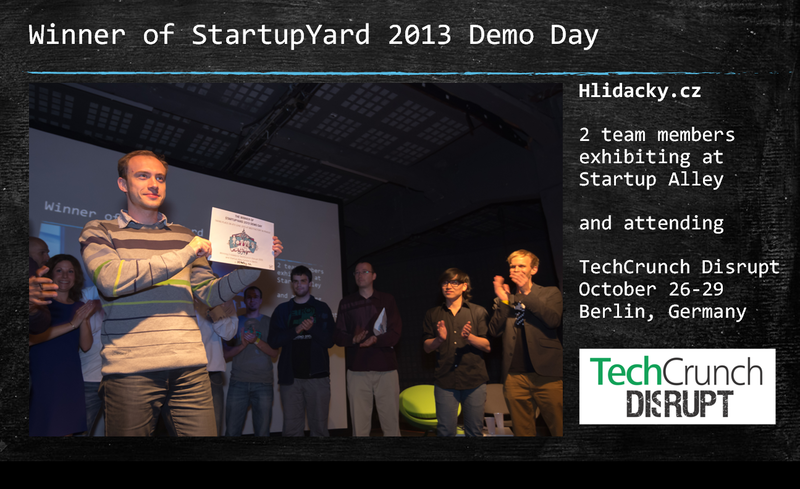 Just a couple of days and StartupYard 2012 teams will show at Demo Day what they have accomplished during last 3 months. Busy 3 months. If you wanna meet some of these guys one-to-one we’re going to hold a pub summit 🙂 on Monday from 7 pm, just add your name to a list.